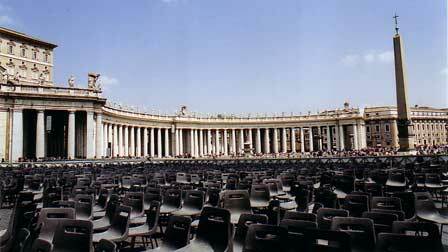 I had been so looking forward to the Vatican! Konrad recommended I should reach the museums early to avoid the queue, so I did just that. I was lucky: the queue was only about 100 meters long. It hadn't quite reached the first corner of the vatican wall. When I came out a few hours later, it had passed it and was reaching the next corner. The museums are immense: I only saw what I really wanted to see, otherwise it would have taken me days. First thing in, I was fooled by a sign that said "Sistine chapel" and followed it, not knowing that I would have to jog through the entire palace to reach it. Twenty minutes later I knew I was getting close when the "no photography" signs began to multiply. The Chapel doesn't disappoint. One can easily spend hours making out every detail and character inside it, and the sheer genius of Michelangelo inspires reverence. I tiptoed out after staring at the Creation of Man for a while, and went straight to the Egyptian Museum. I then did the Etruscan Museum, frustrated by the fact many of the museums and rooms within were closed, but I managed to find (by chance) the Laocoon statue before clearing out. I was hoping we could have access to the gardens, but tourists were only allowed to step outside on a platform overlooking them: no crossing into the Vatican itself. I can hardly blame them -- I would have forbidden tourists altogether. 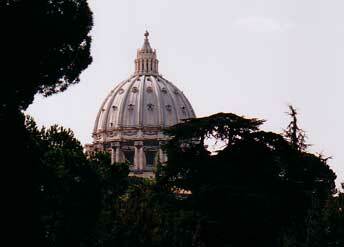 Despite my disappointment, I was enchanted to spot cedar trees in the garden, right in front of St Peter's dome. Having finished with the Museums, I exited again (it sounds easy, but it took me at least 15 minutes to walk out, though) and followed the wall to St Peter's square. 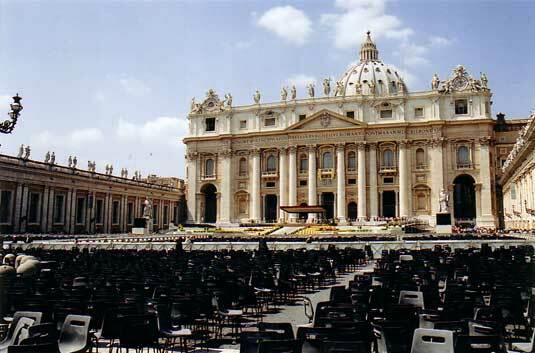 To best appreciate the genius of St Peter's basilica, one has to be aware of all the history of Renaissance art and architecture that culminated into this superlative edifice (if you read the previous pages about Florence etc you already have a good picture.) Suffice to say that Bramante, Rapahel and Michelangelo worked on its plan in turn, and you just don't get any higher on the scale of artistic genius. Bernini was also a notable participant, but I am not keen on his contribution. The previous trio left an abstract basilica in the spirit of the Pantheon, where the architecture and ornamentation were one – in other words, perfect. 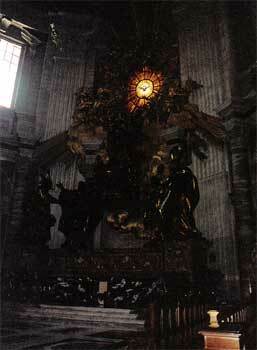 Bernini "suffused it with the baroque spirit" – gah. 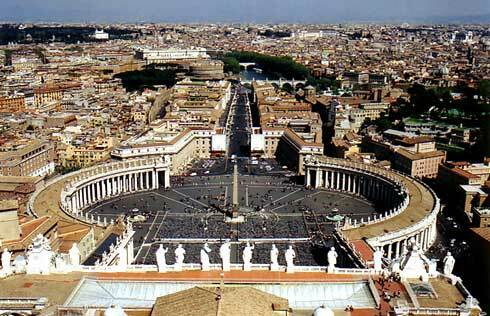 Bramante, Raphael and Michelangelo had worked on a Greek cross plan for the church. 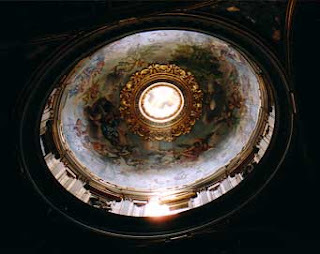 Michelangelo in particular enlarged the dome, making it the largest in the world, but he left it half a meter smaller that the rotunda of the Pantheon, out of deference to the Elders, the Romans whose own architectural genius had allowed the revolutions of the Renaissance. Unfortunately, for liturgical reasons, the nave was lengthened after his death so we ended up with a Latin cross plan. The dome was killed by this idiocy: whereas Michelangelo had intended it to be clearly visible above all else and therefore grandiose, the lengthening of the nave meant the basilica's facade would partially hide the dome. Now when you approach, all you see is the rectangular facade. That's not to demean the basilica though: it is still a most extraordinary piece of art. Just imagine what it could have been if Michelangelo's idea had been respected. I surfed in on a sea of tourists (groan) and went straight to the right where I knew Michelangelo's Pietà could be found. A very beautiful, gentle piece of work, very different from the artist's later work that is a lot more violent and tormented. 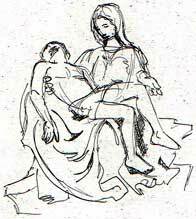 At the time critics reproached to the artist the fact that he had made the Virgin mary's legs unnaturally long, so that if she got up she would be some 2.5 meters tall, and that at the death of Jesus she should be in her 50's, not a smooth-faced young woman. The artist simply replied that being the mother of God, her lap "must be wide enough for us all to sit in", and that as she had never committed a sin, her face was free of lines. It's displayed behind a bullet-proof glass because a few years ago a nutcase attacked it with a hammer. It underwent nerve-wrecking restoration and is now good as new, but it's hard to comprehend how someone could do such a thing. I was very surprised to see no "no photography" or even "no flash" signs. No other church allows use of the flash, as it damages paintings. 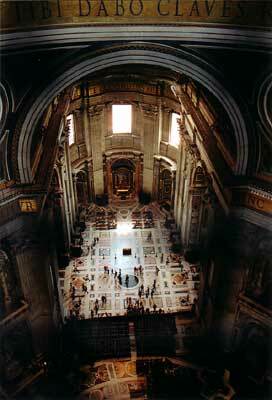 But the reason why it's not a problem in St Peter's is even more surprising: every "painting" you see inside is in fact a MOSAIC. The flash isn't that useful inside anyway. The space is so vast that its light doesn't reach whatever you're trying to shoot... Hence the unpleasant surprise of discovering very dark pictures when I went home. The inside was, as I said, baroquized by Bernini. I can't deny his mastery, just wish he'd practiced it somewhere else. 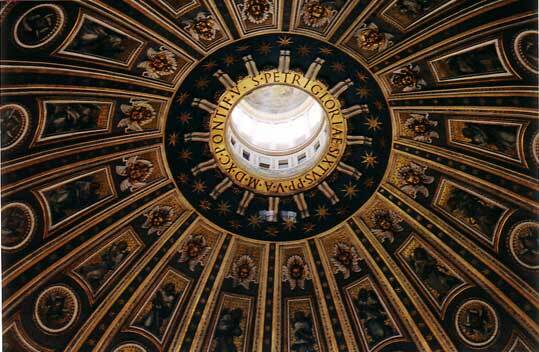 Almost every masterpiece he left in St Peter's comes with its own tale of sorrow. Such is the case with the baldaquin I mentioned earlier, that cost the Pantheon its irreplaceable bronzes. The baldaquin required 11 tons of the metal. Like the dome, like the church, it is the biggest in the world. Beyond the baldaquin, in the apse, is I'm standing inside St Peter's, looking at the apse piece, a stupendous bronze sculpture by Bernini representing the Four Doctors of the Church lifting the throne in the air, below a delicate stained glass window bearing the white dove. The dark bronze doesn't contrast with the background: all the attention is focused on the window. The simplicity of the small stained glass window is a wonderful touch. 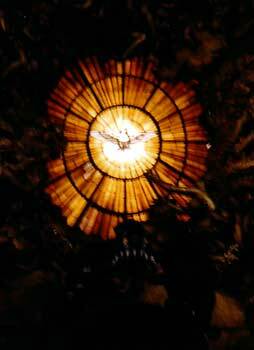 There is just the dove in Bohemian glass, on a golden background made of alabaster slabs to allow the light to softly suffuse in -- a "plastic representation of the supernatural". This is when an American woman walked past me to take a look, and then shouted back to her husband "There's nothing to see." Did you wonder why I hate tourists? 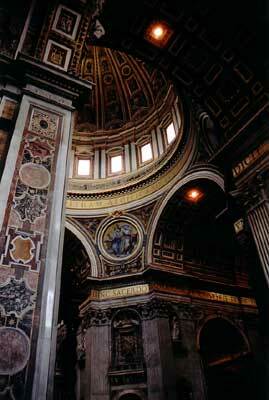 On the right side of the apse is the Barberini Pope's memorial. I mention it because it has a cute touch. The Barberini family's shield bears three bees, and it is present on the carved memorial. But here the bees aren't perfectly vertical, they're slanting a bit -- because "their master is dead, and they are confused". 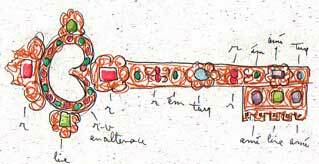 15th century "key of honor" in the Treasury Museum. To finish this quick tour of inside of St Peter's, this funny story about Pope Pious VII's memorial: he could not find a good enough Catholic sculptor, and so he turned to a Protestant one (a Dutchman), but warned him that he couldn't sign his name on the monument because of his religion. The sculptor accepted nevertheless. Once it was ready, the great unveiling took place – and the crowd roared with laughter, because the face of the memorial's Pope figure was not that of Pious VII, it was the sculptor's own portrait! Satisfied with my tour, there was just one thing left for me to do before taking leave of the Vatican: climbing to the dome. The scale is impossible to express. After a long queue I took a ticket for an elevator ride, thinking there was no point in spending another hour climbing. I was had: the elevator ride only brings you at the level of the ceiling, where you can walk around the inside of the base of the dome. 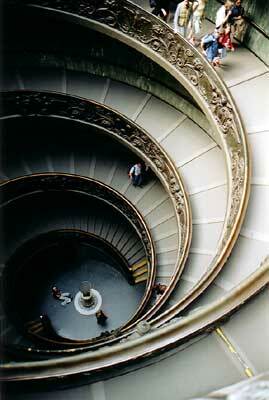 There are 326 more steps of a very claustrophobic climb to reach the very top, where an unforgettable view awaits.